This Roast New York Strip Loin Recipe explains an easy way to cook a New York Strip to give you a delicious steak dinner for a group of guests. Roasting a New York Strip Loin as described here is pretty basic but you can always add your favorite sauce. Or ... flavored butter 0r rub to enhance the meal if you wish. The most important things to remember about this recipe is to first buy the best quality New York Strip Loin you can afford. I recommend natural, if possible. You can look for the beef at your grocery store or, if you plan ahead, such a product can be ordered online. Why natural beef? Read the article by clicking here. 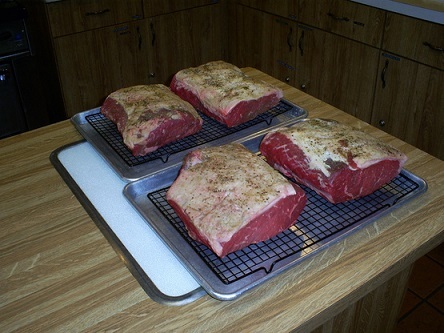 Let the meat sit out of the refrigerator for about 1 hour before roasting. Cooking times are not exact because ovens, and roasts, vary. Allow for more cooking time if needed. Always use a meat thermometer. Check the temperature in the thickest part of the roast and remember, the temperature of the meat will continue to increase a little after you remove the roast from the oven while it is sitting (resting) waiting to be sliced. Preparation time: 30-40 minutes. Serves 6-8, depending on desired portion. Please remember, cooking times are not exact because of differences in ovens and roasts. Also, the roast will continue to cook for a while after removing it from the oven. My 5 pound New York Strip Loin took a full 2 hours, roasting as above. It was a perfect temperature (just between medium-rare) all the way through. I removed the roast when the thermometer read 135 degrees F and it went to 140 degrees F while standing. This is a good example of how important using a meat thermometer is. I was tempted to remove the roast from the oven before the temperature was 135 degrees F because it was taking longer than expected. Fortunately for my guests I resisted the temptation and served a perfectly cooked New York Strip. Serve the Roast New York Steak Strip Loin with garlic mashed potatoes or roasted red potatoes and garden fresh organic green beans! This video is a pretty good one. Slowing the cooking process will improve tenderness. 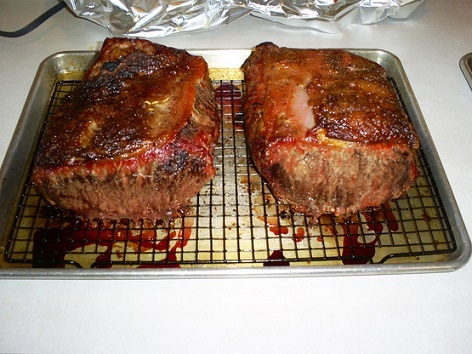 Enjoy your roast New York Strip Loin Recipe and the company of those you share it with!